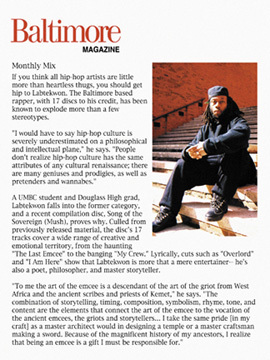 If you think all hip-hop artists are little more than heartless thugs, you should get hip to Labtekwon. The Baltimore based rapper, with 17 discs to his credit, has been known to explode more than a few stereotypes. "I would have to say hip-hop culture is severely underestimated on a philosophical and intellectual plane," he says. "People don't realize hip-hop culture has the same attributes of any cultural renaissance; there are many geniuses and prodigies, as well as pretenders and wannabes." A UMBC student and Douglass High grad, Labtekwon falls into the former category, and a recent compilation disc, Song of the Sovereign (Mush), proves why. Culled from previously released material, the disc's 17 tracks cover a wide range of creative and emotional territory, from the haunting "The Last Emcee" to the banging "My Crew." Lyrically, cuts such as "Overlord" and "I Am Here" show that Labtekwon is more that a mere entertainer-- he's also a poet, philosopher, and master storyteller. "To me the art of the emcee is a descendant of the art of the griot from West Africa and the ancient scribes and priests of Kemet," he says. "The combination of storytelling, timing, composition, symbolism, rhyme, tone, and content are the elements that connect the art of the emcee to the vocation of the ancient emcees, the griots and storytellers, I take the same pride [in my craft] as a master architect would in designing a temple or a master craftsman making a sword. Because of the magnificent history of my ancestors, I realize that being an emcee is a gift I must be responsible for."